← Free Time or Free For All? It must be fall. All of a sudden, we are eating soup again, and the oven is doing double duty as a house heater and cooking device (I will confess to having turned on the heat for an hour or two a couple of times). I’ve been shopping at Aldi lately, and the other week bought one of their bone-in, smoked, hams. ?These are a good deal for us, and I’ve been putting it to many uses. The day after I bought it I sliced the meat from the bone and put together three bags of slices for sandwiches or frying. Two went into the freezer and one into the fridge to be used for the week’s sandwiches (I pack lunches for everyone on co-op day and on gym day so that we can eat in the car on the way home and not end up with starving, cranky, children). I also put the bone in the freezer for later use, along with a bag of scraps that weren’t really good for sandwiches. This week I pulled out the bone and put it in the crockpot to turn into broth on Tuesday morning. 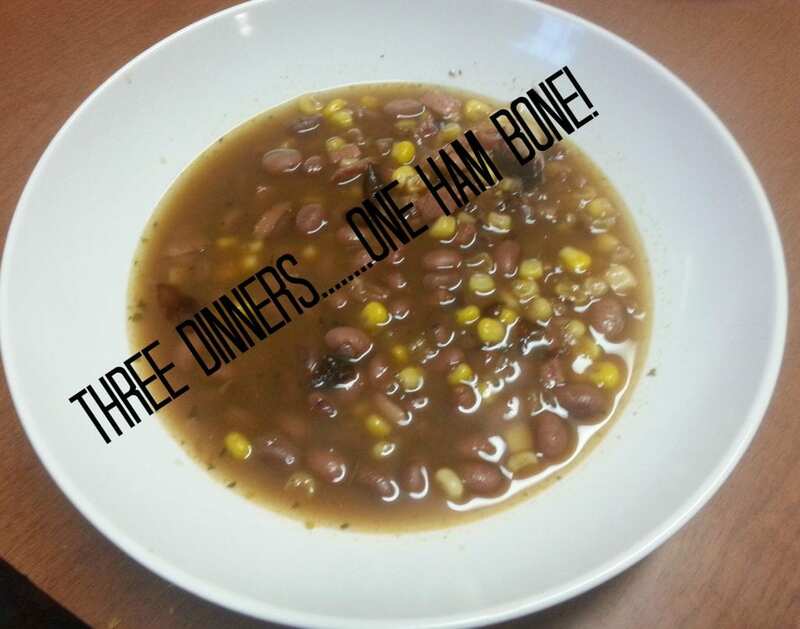 S had cooked a quart and a half of white beans over the weekend and put them in the fridge, so for supper on Tuesday night we had ham and white bean soup, with the broth and the little bits of meat that had fallen off the bone during the day. I used about a pint and a half of the beans along with the ham broth, some dried fried onions (like the kind that go on top of green bean casserole) that had been hanging out in the pantry for a while (because I was TOTALLY out of actual onions) and seasoned the pot with salt, pepper, Spanish smoked paprika, Chipotle, Ancho, and a dash of Cayenne to make a dish that was warm with a hint of smoke and spice. A pot of soup and a baking sheet of rolls made a lovely meal. I put more water on the ham bone and simmered it overnight to provide more broth for Butternut Squash Soup. The squash went into the pot along with the ham broth (about a quart), the rest of the white beans, Oregano, smoked Paprika, dried fried onions, parsley, Chipotle, and Cayenne. ?I was out of roll dough so we had a pan of biscuits instead and not a scrap of food was left. Back the bone went into the pot, along with some bits of fat from the ham I had pulled for sandwiches. I made another batch of broth and S started some more beans, little red kidneys instead of white beans for some variety! 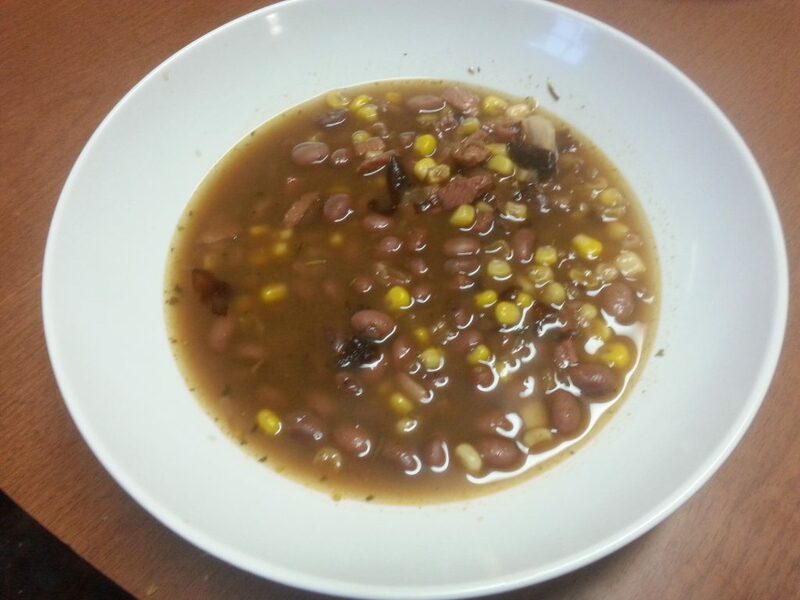 Last night’s supper was: ham broth, red beans, finely chopped ham, a can of corn, the last of the fried onions, and spices (cumin, rosemary, parsley, chipotle, smoked paprika, salt, and pepper). Along with it I made cornbread, pouring a drizzle of local maple syrup over it when I took it out of the oven. The soup came out a bit spicier than I had intended so the children added milk to their servings to back the heat off a bit. The ham bone is completely used up at this point. The marrow disintegrated into the broth and I’ve thrown the bone away. I’m pretty pleased though, three meals with an average cost of >$10 is awfully nice when feeding this crowd! This entry was posted in chicken bones, cooking, stretching your food dollars, Uncategorized and tagged Cheap Eats, chicken bones, cooking, dairy free, gluten-free, stretching your food dollars. Bookmark the permalink.